Following the announcement of William and Kate's engagement, the couple performed a series of engagements before the royal wedding giving us the opportunity to get to know Kate and giving us a glimpse into what William and Kate, as future King and Queen Consort would bring to the British Monarchy. Prince William and Kate made their first public appearance since the engagement announcement on December 18th 2010 at the Teenage Cancer Trust charity fundraising gala in Norfolk. The Christmas Spectacular featured a cast of professional singers, dancers and musicians. Proceeds from the evening went towards the cost of building the first specialist cancer unit for young people at Addenbrooke's Hospital in Cambridge. Kate looked elegant in the Temperley cream and black silk Titan dress and a black fitted jacket. The couple were invited by Emily Van Custem, chairman of the Teenage Cancer Trust's East Anglia volunteer committee, who is a close friend of William. Both William and Kate appeared totally at ease in each other's company and the event gave us an insight into the future royal partnership. You can watch a video from the event here. In February 2011, William and Kate visited Trearddur Lifeboat Station in Anglesey to launch the RNLI station's new Atlantic 85 inshore lifeboat, the Hereford Endeavour. Anglesey is the couple's home while William works as a Search and Rescue pilot at RAF Valley and the a Palace spokesman revealed the couple asked for their first joint engagement to be on the island. There is a great video from the engagement at the BBC. Next, the couple made a triumphant return to the university where their fairytale began. You can watch a video from the memorable visit here. The same day, Kate accompanied William and Harry to sign the book of condolences at New Zealand House in London for the victims of the earthquake in Christchurch, New Zealand. Kate wore a beautiful black coat, red dress and knee high black boots. Kate sported a Burberry trench for the couple's visit to Belfast. 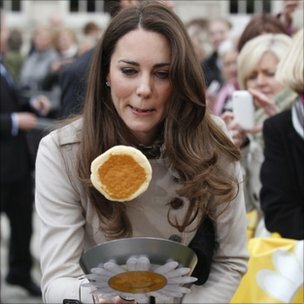 As it was Pancake Tuesday, Kate got into the spirit of the day by flipping pancakes. The couple visited Youth Action Northern Ireland where they watched a short play and met with crowds who wished the happy couple well with their upcoming wedding. 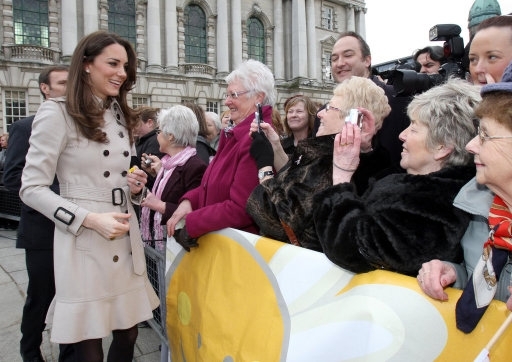 Kate thoroughly enjoyed meeting people and smiled throughout the day of engagements. You can watch a video here. For their final pre-wedding engagement, William and Kate visited Darwen Aldridge Community Academy and Witton Country Park in Lancashire. A crowd of over 15,000 braved the rain to catch a glimpse of the pair. The couple watched a student work on a dress in a textile class at Darwen Aldridge Community Academy. With just over three weeks until the royal wedding William and Kate looked very much in love. To watch a video from the visit please click here. Thank you for your increased comment moderation. I had quit reading comments because I was dismayed at the hostility and negativity I was seeing. I only visit your blog to look at pretty pictures of the lovely Duchess Catherine. I really like Kate's early style, pre wedding. Her hair is much nicer not so keen on the big curls she has styled at that moment. I love e the fact she wore boots on her engagements, black opaque rights and shorter hems. She looks no less royal or elegant. Just younger and more stylish. Feel she's getting a little bogged down in royal style dress sense lately. Completely agree! I stopped reading articles on Daily Mail because of all the Kate-Hating from people. I come to this site because I love Kate and her style and I can't get enough! Haters don't have to visit a site soley about Kate if they dont care for Kate! why they never hold hands? I believe they do not hold hands in public because of royal protecal. The Duchess & her Prince show more affection toward each other then most of the royals. They have been photgraphed holding hands during their private time together. But during royal business you will never catch them holding hands. Charlotte if I am incorrect, please explain why they do not hold hands in public doing royal duties. Sorry Pauline, but how should Charlotte know this, please? She is not in touch with HRH. "discussions such as 'how much Kate does/doesn't work' do not belong here." The discussion on how much she does/does not work had led to nothing but friction on this blog and as we cannot accurately say how much/little work Kate does in her private time I see it as pointless. The 'Kate Loves' section mainly involves looking back and I write it due to popular demand. Many of the readers enjoy it. Hi Charlotte, but questions what the job as a military wife include are not offensive, neither aggressive. So, moderating strictly in one direction and allowing only comments like "the beautiful duchess and her prince" is a bit one-sided. So please allow freedom of speech for non-aggressive comments. If you've had a chance to follow the blog for a while you will know I 100% encourage and advocate freedom of speech and *always* respect different opinions. It would be very boring if all everyone did was praise Kate for no reason. Constructive debate is so important to any discussion but the recent comments on her work ethic were pointless. We cannot ever know what she does in her spare time. I understand the point comes up every now and again but it was dominating the general conversation on the blog. All of you see the comments published but there are a substantial number I could not publish due to the profanity and truly hateful content. This is quite new and I'm eager to discourage that level of negativity and of course encourage respectful debate. @Robert- I don't believe it is our job to say how much the Duchess works or does not work. I think it is the Palace who schedules what, where & how many engagements the Duchess does a week. And there is alot of things regarding the Duchess that Charlotte can write. If you are a real fan and have been reading her post for the past year or so you will see all the different things she writes about to keep us fans up to date. She has the best blog out there regarding the Duchess & her Prince. I think that's fine Charlotte, it's your blog so ur welcome to publish or not publish whatever you like, let the haters move on somewhere else instead! Thank you Charlotte. Your blog is the best around. But I too stopped reading the comments. I hope monitoring doesn't take up too much more of your time. I appreciate your efforts. This blog is special and my favorite because of you. I can't wait for the next Kate sighting and your post. Excellent idea, thank you Nicole. Thank you so much for addressing the negative/hostile comments. And thank you for another terrific post on the Duchess. It's lovely to look back and recall the pre-wedding excitement. I'm all for debate once it's constructive and try not to interfere much with the flow of the discussions but it has got very much out of hand lately and it is time I addressed it especially for those who felt uncomfortable posting due to the negativity. Love this blog. Thank you for all your hard work to keep us fans up to date on the Duchess. This Kate Loves is a great idea. It brings us back to the Duchess in her early times and to the present. Great job Charlotte. Thanks for the post, Charlotte! I didn't start following Kate's fashion choices until shortly before the royal wedding, so I hadn't seen a lot of these. Thank you Charlotte for the increased comment moderation. It was definitely getting too negative and disrespectful towards Kate since you got your blog up and running again after being shut down for a short time. I'm not British but I'm fascinated with both William & Kate and what the future awaits them, which is why I fell in love with your blog(minus the negativity). You're informative along with your respect for the Royals. Charlotte, I love your blog. Anything you want to do to maintain it is fine with me. One thing -- it looks glamorous to wear wonderful clothes, travel with a handsome royal husband, and be famous. But it's actually very stressful, trying to look perfect constantly, meeting strange people in strange places, trying to look good in strange, challenging climates and places. And trying to remember what to say and what not to say to whom and when. Ditto for what not to do. Especially when your own feelings may be sad or angry, but the only display of feelings that is appropriate is happiness and graciousness. It's a tough job -- I wouldn't want to do it. So true and well said! I wish she would take a break and focus on babies... I wouldn't blame her one bit for wanting to be out of the public eye after all the envasive photos. I agree with both of you Anonymous. I would not want to walk in the Duchess's shoes. Just thinking what she must do to get ready for any engagement,just blows my mind. And not to say what she had to do and how long it took her to get ready for the Asian tour they just finished. I take my hat off to both William & his Duchess, they did the royal family proud on this past tour and on all they do for the family and in the name of the Queen. Absolutely! I hate seeing people complain about how 'easy' she has it. I know I wouldn't want to swap jobs! I agree with you Eleira. I would not want to walk in her shoes. She does a wonderful job for the royal family. The Duchess has brought a breath of fresh air to the family. And I sure hope the Queen and the rest of the family see what she has done. You're doing a great job! I like this post because it allows us to look back to a specific time period, and recognize how much has changed / stayed the same. I liked her style better before the wedding and durign the first year of marriage. I think she's being too careful this year. Hopefully she'll ignore the critics and follow her own style again. @Charlotte: You name your blog : Following the life .... so I think it includes as well to see how much she work. She is a role model in her position. Absolutely but we do not and cannot know how much/little Kate does in her private time and the conversation had turned to bashing Kate at every opportunity and caused many readers to feel uncomfortable posting. I agree with you Charlotte. We do not know how much the Duchess does behind the scenes. Nor is it really any business of ours what she does or does not do. She does not have to answer to us fans but to the Queen. But her most important job at this time is to be the best wife she can to William. I do miss these styles too! I'm not sure exactly what's changed, but I love the coats, tights, and boots. I've also always adored the scarf/fascinator combo at the Anglesey lifeboat station. Yes. i do agree that her dress style seems more conservative (matronly?) now. Hope turning 30 hasn't made her do that! Oh my goodness, I just love the pictures you posted above where the Duchess & William have their arms around each other. It is such a breath of fresh air to see that they are not affraid to express their love for each other in public. And they continue to do so now that they are married. Just the look's they give each other. They just show's how much in love the are with each other. Thanks for this post - it was lovely to look back on their earliest engagements. Is there going to be a Kate Loves Holidays, or a Kate Loves Shopping? With complete sincerity, I don't see why not. I did a Kate Loves on some of Kate's favourite holiday destinations a number of months ago. Charlotte I woullove for you to do a Kate Loves William. With all the great pictures from theri early days and the ones from the past 19 months since they were married. I went through your Kate Loves section and there is not one. I know you did one before you had to close the blog for the few weeks so I think it could have gotten lost. So I hope you will do another one. PLEASE. I love Kate's style very much, actually she has changed my own. My husband has always wanted me to wear more dresses or skirts (I have almost only trousers in my wardrobe), but Kate has helped to fulfill his wish. I do have some summer dresses now and this autumn I am definitely going to buy a skirt which matches my two pairs of boots. I would never have come across the idea of wearing boots without Kate. So thank you, Kate, for inspiring me and changing my own style for the better and thank you, Charlotte, for showing older and new pictures of Duchess Kate and thus invite me to create new ideas about my style. Dear Marion, that is wonderful to hear. Your style has obviously evolved so much and skirts teamed with boots are one of my wardrobe staples for the winter. About the negative comments, I do agree with you that we all have our opinions, and sometimes must be able to criticize her outfits or behaviour - we don't want a boring blog ! but it must be done in a respectful way. We enjoy your blog because we like and admire the Duchess and Prince William. We do want "freedom of speech", as you say, but we don't want spiteful or hateful comments. We all come here for pleasure and laughter, not excessive negativity. Oh, I didn't know the videos and the pictures from the signing into the book of condolences at New Zealand House in London. Thank you Charlotte for this wonderful post!! I love the boots, too. The red outfits were some of my favorites. I have been trying to discover how to register as there are so many named "anonymous" adding comments. I don't go on to other social sites--help please. I do love your reports and it was great when people commented on her clothes and left the comtentious posting to other sites. You can comment with an open ID, wordpress or live journal account. Alternatively you can reply under name/url and just leave your name instead of anonymous. For awhile there, I would skip all comments from 'Anonymous' as many were negative (now fixed by a change in policy) - but actually if pressed for time, I skip 'Anonymous' comments anyway. My reasoning behind this is that there is no continuity behind any 'Anonymous' comments, whereas comments from those with names - over time, I can link their opinions and it becomes more meaningful. Kate fans - it would be good for you to add where your from when use the Name/URL to reply as. For example see mine. :-) i think it's great that we are following Charlotte blog from around the world....so let's all share where we are following from. Thanks for asking, Jean... I was also wondering how to register. That is a great idea! I've often wondered where everyone is from...! I'll definitely try to remember to do that each time I post. So, no criticism allowed? Too bad. I enjoyed this blog. But with that sort of attitude, mentality and thinking, it really tarnishes it. And sad for those with their blinders closed for they're obviously ignoring the desire of the Queen herself for the royal family to be seen as more human - which they are. Constructive criticism is *always* welcome here. Thanks for this "flashback", it was wonderful to see the pre-wedding engagements again. I started following news about Kate and her style the day their engagement was announced and on the one hand, it feels as it was just yesterday, and on the other hand, as if it would have been ages ago. Like Marion, I also got more interested in fashion and my wardrobe changed and improved, which is great. And also thank you for your note about the comments. I followed your blog almost since the beginning and always appreciated the friendly and respectful posts and discussions with different opinions. Life would be very boring if everyone would have the same opinion, wouldn’t it? But lately I also noticed that the general tone changed and that some discussions seemed to be pointless and endless. Therefore I hope we can get back to a respectful and constructive way of agreeing and disagreeing again. Thanks Charlotte for the effort and dedication you put into this blog! Exactly my thoughts, thank you and thanks to everyone for understanding. As you all know constructive criticism is always welcome without it we would never have debate but it must be constructive. Thank you so much your note regarding the comments. I appreciate your politeness and kindness that make your blog so different and so pleasant to read. Please keep up the excellent work and thanks again for the lovely posts of the Kate and William before their wedding ! Robin Indiana USA HI Charlotte, you have a wonderful blog. I have not posed in a while felt out of place. Your blog makes me smile when I am down or happy! Keep up the great work. I love all of the Duchess looks she is so beautiful and inspires the world of happiness and love. This was a very interesting read. Thank you Charlotte for recapping their engagement time! The picture quality is awesome and it was fun going through all the videos.Also, thank you fair being a fair an impartial moderator. Im very impressed with the way you handle all the comments coming through-good, bad and ugly. Keep up the good work, Charlotte!! I have to admit I haven't read all the comment sections and was unaware negative comments were proliferating. I do believe there are those who are predisposed to dislike and criticize, regardless of activity or celebrity, but hope they are few in number and find another place to exercise their free speech. This blog remains a delightful place to keep up with royal fashion and appearances, and I always enjoy reading and perusing the photos in each new posting. Thanks for all the good work, and please understand that the decision you have taken is supported by almost all of your readers. However, in the unlikely case that Kate does something truly outrageous, we reserve the right to be astonished! Thank you for addressing the negativity. It is one thing to offer your opinion/speculations but it is another to be venomous and negative. I love this blog because of its content and because of the readers...it has been so fun to interact and see other's perspectives and opinions. This site is fun, informative and POSITIVE (meaning respectful). Thank you for taking steps to ensure that it stays that way and doesn't turn into some other Kate sites whose comment sections are catty and ridiculous. I really enjoy this blog and whole heartedly support Charlotte and her stand on negative, vile comments. Too often sites are bogged down with negativity and vitriol and I for one do not think it appealing to read the rant of someone with a tiny mind. As Charlotte has said, constructive criticism is the order of the day! Keep up the good work Charlotte, I thoroughly applaud your efforts and enjoy your updates immensely. Thanks Charlotte and others who explained how to put my name on. Cool! Welcome Jean! I just love seeing where everyone is from. Where is Lancashire? Is it in the UK? Thank you for the article and for stepping up to the undesirable task of weeding out inappropriate comments. I would also find it helpful if you would not publish articles where individuals read questionable media articles and use that as the basis for speaking with authority about the duchess. Those articles also taint the wonderful flavor of you posts and I fear those posts incite the rude comment. Great job on trying to please everyone yet maintain your own point of view. Suspect between posting and picture issues you have learned some tough life issues but the grace in which you handled it was stellar. I really love these pictures. It's actually a little disconcerting to view them now. Kate was so young, happy, healthy, beautiful, and she followed her own style (I love the boots, the black tights, and the trendy coats!). Her hair also looked shiny and lovely, but it didn't have that set giant-sausage-curls look to it yet. She still looks happy and beautiful now, but her look has definitely changed. I'm sure the royal handlers think she looks more polished now, but I think a lot of the royal "styling" makes her look significantly older than she did right before the wedding. Charlotte -- keep up the *PHENOMENAL* work! I absolutely love this blog -- I check it every day from Chicago, IL USA. If you're ever able to find and post photos of Kate when doing the walkabouts, from a distance, I'd love to see them. So many close up photos are wonderful, but I think it would be interesting to see what the scene looks like from a distance -- it would give some perspective of just how many people show up to see HRH and how crazy it must be for her at times -- so many people, so many cameras, so much distraction. Thank you, thank you, thank you for a wonderful blog! Hello! I absolutely loved this post! It was such a good idea! I am glad you won't publish disrespectful comments anymore. I am a faithful reader here, have always posted my comments and opinions since the beginning of you blog. But lately I wasn't doing it anymore because a lot of "anonymous" were breaking the great enviroment we used to have around here. I am sure most of your readers are delighted to know this won't happen again. I know I am!!! Loved all of Catherine and Williams pre wedding engagements. Great publicity. I think the appearances assured the public that Catherine was more than ready to take on the task of becoming a member of the royal family. As always, Catherine carried out every engagement with poise and grace. All of her ensembles were fabulous and appropriate for every occasion. I love her, wish she was my future Queen!! helpful features, put together with sleek and cool styles. The tide watches incorporate an entire line, including tide data. On the other hand the barometer only measures in the increments of.